I made this point in the "digital-is-evil" post on Wednesday, but it bears repeating: Being able to just drag and drop copies of trailers onto the front of a movie's playlist rather than having to decide which print you're going to physically attach one of your limited copies to can lead to serious overkill for people who go to the movies often. But at last, two of the more ubiquitous previews in recent months are going away! Hurrah! 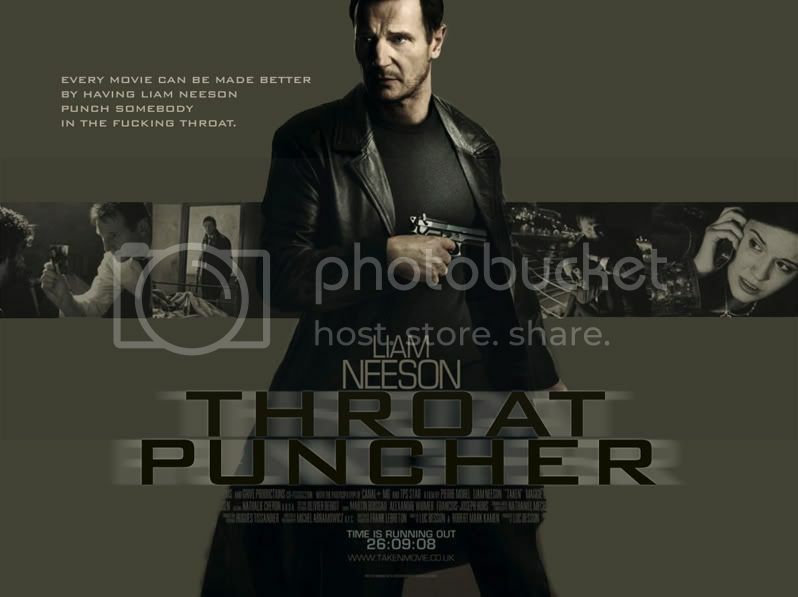 The first flick pushing its preview off the screen is Taken 2, which should have taken a hint from David Cornelius's awesome photoshopped poster and called itself Throat Puncher Two, if only because that means they wouldn't necessarily feel the need to repeat the plot of the first so closely, because that's stupid: When kidnapping a man's daughter leads a man to efficiently murder every criminal in a city, you as a criminal may want to get your revenge in a way that doesn't involve kidnapping his family, because there'd be no need for revenge if that sort of thing ended well. Still, despite the early warnings that new director Olivier Megaton presents action poorly despite having a cool pseudonym, I'm looking forward to more of Liam Neeson, Maggie Grace, and Famke Janssen. Especially Famke Janssen. Every movie needs more Famke Janssen. Anyway, it plays the Arlington Capitol, Fenway (including the RPX screen), Boston Common, and Fresh Pond. The preview for Frankenweenie hasn't quite reached aggravating levels for me, but I don't see that many kid movies. It's being called a return to form for the lately-disappointing Tim Burton, who expands his short film about about a family dog being brought back to life to an animated 3D (black-and-white) feature. For those who track the change in exhibition technologies, it appears to be the first digital-Imax flick at Jordan's Furniture and the first digital 3D movie at the Somerville Theatre (2pm and 9:15pm shows only), as well as playing in both 2D and 3D at Boston Common (including the Imax-branded screen), Fenway, and Fresh Pond. Boston Common also keeps Vulgaria around for one afternoon show per day and opens Head Games, the new documentary by the directors of Hoop Dreams which spins out of former football player and WWE wrestler Christopher Nowinski's book about the rising incidence of concussions and traumatic brain injuries in sports. The Somerville Theatre also picks up Pitch Perfect on its originally-planned release date. The Brattle Theatre has switched their Watch-a-Thon fund-raiser up this year; instead of a month of counting up movies, it's two twelve-hour marathons, and you can help support the Brattle by either buying an all-day pass, hitting single screenings, or sponsoring participants. Saturday is cult movies - Down By Law, Tokyo Drifter, Harold and Maude, Brazil, a secret screening, and Miami Connection - and Sunday is classics: Modern Times, Cocteau's Beauty and the Beast, a different secret screening, The 39 Steps, Night of the Hunter, and Yojimbo. On either side, there's the rest of the Cloak & Dagger: Spies on Screen series. A double feature of The Bourne Identity and Hanna plays Friday; Hitchcock's North by Northwest and Fritz Lang's Ministry of Fear on Monday; Three Days of the Condor and The Mackintosh Man on Tuesday; Our Man in Havana (rescheduled from last week, with The Silencers cancelled) and OSS 117: Lost in Rio on Wednesday; and a single feature of Cloak & Dagger wraps it up on Thursday. Two movies open at Kendall Square, both kind of shaky. The Oranges is a comedy-slash-drama starring Hugh Laurie as a man who falls for his best friend's daughter (Leighton Meester), thus throwing this tight pair of families into chaos. It's good in spots, shaky in others. The same can be said for horror anthology film V/H/S, which has several different takes on found-footage horror; I found that doing several short stories worked against the found footage conceit and don't recall ever actually being scared. It's got a one-week booking. V/H/S will have midnight bookings at Coolidge Corner next weekend; this weekend is too packed with other midnights for it to fit. Both Friday and Saturday feature screenings of The Funhouse, which kicks off a month-long celebration of Tobe Hooper's films, and features a bunch of kids sneaking into a carnival after hours, which is probably a bad idea. Friday night offers the monthly screening of The Room, while Saturday is J. Cannibal's Feast of Flesh XII; this year's Halloween extravaganza features local metal group Black Thai, a zombie costume contest, the costume-shedding of Black Cat Burlesque, and a screening of Stuart Gordon's Re-Animator. Other special screenings include a "Stage & Screen" showing of Gore Vidal's The Best Man on Monday evening, which will feature the writer and director of the new play Now and Later (Christopher Shinn and Michael Wilson, respectively), discussing how Vidal's work influenced theirs. The screening of Escape Fire: The Fight to Rescue Health Care on Friday at 7pm will have Dr. Donald Berwick present to discuss the documentary afterward; the film plays in the video screening room all week. Samsara, on the other hand, will be playing on 35mm film as it moves over from the Kendall, while The Master continues in 70mm. The Harvard Film Archive begins a month-and-a-half long retrospective, The Mysteries of Michelangelo Antonioni, on Friday; it will continue until 18 November. This week's selections of L'avventura (Friday 7pm & Sunday 4pm), La Notte (Saturday 7pm), Story of a Love Affair (Saturday 9:30pm), Blow-Up (Sunday 7pm), and The Mystery of Oberwald (Monday 7pm); La Notte and Blow-Up will be repeated later in the program. There are also a pair of free VES screenings (meant for students but open to the public) during the week - The Rules of the Game on Tuesday and October on Wednesday. ArtsEmerson continues their Shakespeare on Film series, with Shakespeare in Love (Friday 6pm); My Own Private Idaho, which apparently is based upon Henry IV andHenry V (Friday 9pm); The Lion King (Saturday 1pm); Olivier's Hamlet (Saturday 6pm); and Rosencrantz & Guildenstern Are Dead (Saturday 9pm). All are on DVD aside from Shakespeare in Love, which is 35mm, and lead up to the opening of a new production of Hamlet from the Shakespeare's Globe Theatre in London. Of course, once that starts, the film program shifts, with the Sunday 1pm screening being Alexander Payne's Election. The MFA holds David Redmon's and Ashley Sabin's Downeast over for another week or so, though screenings are scattered - 5pm Friday, 5:40pm Wednesday (the 10th) and 3:15pm Thursday (the 11th). Those are scheduled around a number of programs, most notably The 6th Annual Boston Palestine Film Festival, which has screenings Friday, Saturday, Sunday, and Thursday. There's also a Hispanic Heritage Month Short Film Festival program as part of their Fall Open House on Monday the 8th, and the first screening of Alps on Thursday the 11th at 5pm. That's Greek filmmaker Yorgos Lanthimos' new film following Dogtooth, a dark comedy about people who impersonate the deceased for grieving families. It will have screenings through the 21st. The Regent Theatre in Arlington has a couple of "Sound Cinema" presentations, both encores of sorts. Pat Metheny: The Orchestration Project played there a week or two ago, and was apparently popular enough to be brought back for two screenings on Friday the 5th. Marley played at Kendall Square during the summer, but will play the Regent on Wednesday the 10th. My plans? Well, I'm heading north for a niece's birthday party on Sunday (since we share the same birthday, I really can't overlook this), and will probably catch Taken 2, Frankenweekie and Head Games at various points. Aside from that, there's an awful lot of good stuff in the Brattle's spy series, so I may just live there.